Donald Trump – the Republican presidential candidate who often boasts to be “really rich” – is leading Democratic candidate Hillary Clinton among American voters making the most from their jobs. 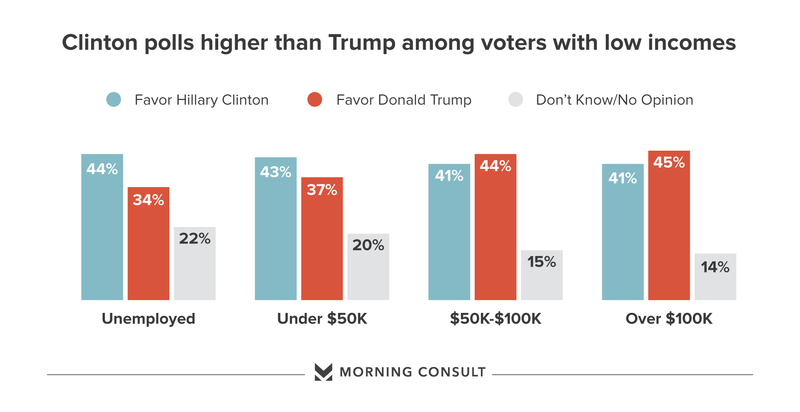 According to a national survey of 23,347 registered voters conducted by Morning Consult in June and the first two weeks of July, Trump leads Clinton, 45 percent to 41 percent, among voters making more than $100,000 annually. He also leads Clinton by 3 points, 44 percent to 41 percent, among voters who make between $50,000 and $100,000. But Clinton has a larger lead over Trump among the less wealthy and those down on their luck. She leads Trump, 43 percent to 37 percent, among people making less than $50,000 annually and by 10 percentage points among people who are unemployed, 44 percent to 34 percent. On the campaign trail, Trump has focused on immigration and trade and their impact on the American economy to underline his policy contrasts with Clinton. While he has praised globalization in the past, on the stump now he rails against trade deals such as the North American Free Trade Agreement and the Trans-Pacific Partnership. Clinton had previously supported those deals before beginning her campaign for president. Trump’s protectionist rhetoric seems to be having an impact among blue-collar voters, who back him over Clinton by 5 points, 44 percent to 39 percent. Protectionism has also seen Trump poll competitively in the Midwest, where many Rust Belt jobs have been lost over the past several decades. The economy is more at the forefront of wealthier people’s minds than those with more modest incomes. Four out of 10 of the highest earners list economic issues as their top priority when heading to the polls, while 35 percent of people who make $50,000 to $100,000 a year say the economy is their top issue. Less than one-third of people making less than $50,000 annually (31 percent) say the economy will most guide their decision at the ballot box. Voters making less money are slightly more likely to say the country is on the wrong track. Three-fourths of voters making less than $50,000 said the country was trending in the wrong direction, compared with 73 percent of voters making between $50,000 and $100,000, and 68 percent of voters who make more than $100,000.